You don't have to get married to settle down and leave behind your wild ways - you just have to expect to get married soon. Researchers found that teenagers and young adults who expected to get married within the next five years reported committing fewer delinquent acts in the next year than those who weren't thinking about wedding bells. While other studies have shown that people commit fewer crimes when they get married, this is the first to show that people straighten up their act even before they tie the knot. 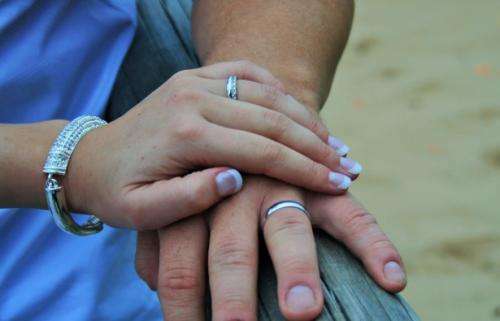 "You may start to act married even before the wedding," said Rachel Arocho, lead author of the study and a research fellow in human development and family science at The Ohio State University. The results show the importance of marriage in today's society, even though many Americans are delaying the relationship milestone until they're older. "This is a reminder that marriage still matters," said Claire Kamp Dush, co-author and professor of human sciences at Ohio State. "Just the expectation of marriage may be enough to change some people's behavior." The study appears online in the Journal of Marriage and Family and will be published in a future print edition. The researchers used data from the National Longitudinal Survey of Youth 1997. This study included 7,057 people who were 15 to 20 years old when the data for this study was collected in 2000 and 2001. The participants were asked in 2000 and 2001 to estimate the percent chance that they would be married in five years. They were also asked whether they had committed certain delinquent acts - including property theft, personal assault, drug dealing and property destruction - since the last time they were interviewed for the study. On average, participants in 2000 thought there was a 43 percent chance they would be married within five years, increasing to 48 percent in 2001. In 2000, there were 1,492 young people in the study who reported any delinquent acts and they averaged 1.74 such acts in total. In 2001, participants reported slightly fewer delinquent acts, with 1,273 reporting an average of 1.62 incidents of misconduct. The key finding was that young people with higher marital expectations in 2000 had lower levels of delinquent activity in 2001. Somewhat surprisingly, the researchers did not find a link in the opposite direction: Delinquent activity did not seem to be strongly associated with later marital expectations. "It seems that young people think of marital expectations independently of their current participation in delinquency or crime," Kamp Dush said. There are good reasons why people who expect to marry may be avoiding a life of delinquency, Arocho said. They probably feel they have to watch their behavior to gain social acceptance and be seen as "marriage material," she said. Plus, people with a job, good income and education all have a better opportunity to get married - and delinquency stands in the way of achieving these goals. "If you're thinking of getting married soon, you may do things differently and you act more like an adult," Arocho said.